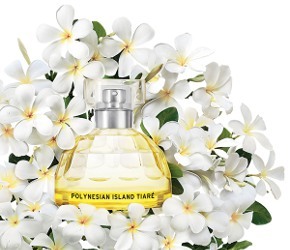 The Body Shop will launch Polynesian Island Tiaré, a new addition to the Voyage collection (previously known as the Scents of the World collection). The last in the series was Italian Summer Fig. Come away with us to the Polynesian Islands this summer and surround yourself with the Summer scent, Polynesian Island Tiaré eau de toilette. The luminous blossoms of tiaré are used by generations of Polynesian women to adorn the hair and perfume their sun kissed skin. We handpick the young buds before the morning dew to preserve the brightest, freshest, purest summer scent. The notes include bergamot, orange, tiare flower, frangipani, ylang ylang, coconut and vanilla. The Body Shop Polynesian Island Tiaré will be available in 50 ml Eau de Toilette, 100 ml Fragrance Mist and matching bath & body products. Look for it in May. The bottle looks like it should be a Flowerbomb flanker. Yeah. It’s what they’re using for that whole series now. I bet I’d be up for some body products in this scent. Looks like shower gel, body lotion, and tub of body cream. Also, body products (but no EdT) in another fragrance called Pinita Colada. Don’t know the notes but images of coconut & pineapple.